Japan, 2001 Colour – 124 min. Ten years old Chihiro (Hiiragi) travels with her parents to their new home. Having doubts about their route, they follow to what appears to be a shortcut ending up at the entrance to a long tunnel. They decide to leave their car behind and cross the tunnel by foot arriving at an apparently deserted city. 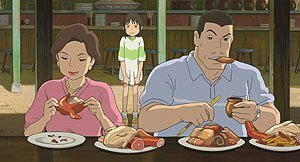 The girl’s parents, drawn by a compelling scent, go into a restaurant and start eating despite the fact that there is no one there. Feeling uncomfortable and wishing to go back, the little girl walks through the city running into ghosts and other strange creatures. She runs back to her parents only to find out in shock that they have been both turned into two fat pigs. 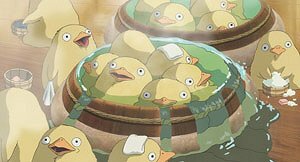 The city turns out to be a resort for gods and Chihiro is forced to work at the witch Yubaba (Natsuki)'s bathhouse, as she looks for a way out and a means to save her parents. Due to its known handicap in dealing with culturally different material, Disney did not make much effort to promote Mononoke Hime (1997) – the box office no.1 in Japan until Titanic –, a film also directed by Miyazaki, and the bad results in the box office may have contributed for the Mickey Mouse company's decision not to buy the world rights for the film. 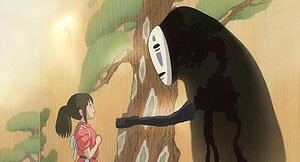 A bad choice perhaps, for Spirited Away comes closer to the children’s film that the distributor wished for Princess Mononoke to be. Movie-goers however will possibly approve the fact that the distribution does not come directly from Disney or Miramax (that usually distributes the more “mature” titles not fitting into the “for the family” spirit of its mother-house), for we would probably get the usual English dubbed copies, without any other option (while some critics would get their kicks appraising the excellence of John Lasseter’s work). Fortunately, that did not happen and we could watch the film in all its glory, in its original Japanese and with Portuguese subtitles. Although many families took their children to watch the dubbed version – I'm certain that the Portuguese dubbing job doesn't lack in quality but it does not especially interest me –, it is also true that the film’s narrative is too complex for children under nine or ten years old, i.e., the age of the protagonist and of the more concerned audience. A child who does not know yet how to read is probably not mature enough to understand the story’s development and one can almost foretell much hyperactivity between parent and child, normally seen in those films that “should” have been dubbed but are otherwise subtitled ("who is that? ", "is he dead? ", "is he bad? ", "what is happening? ", "I want to pee!"). A tasty but very expensive meal. 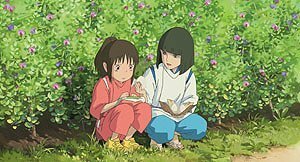 Spirited Away was the no.1 film in the Japanese box-office at the time of writing and its success has widespread through other Asian countries and film festivals, where it gathered several awards. It has been noticed in the West mainly after achieving the Golden Bear at the 2002 Berlin Film Festival (ex-aequo with Paul Greengrass' Bloody Sunday). 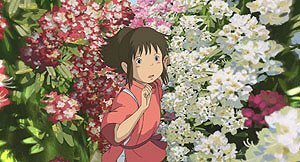 Miyazaki's film is also one of the most appreciated by the critics, something reflected by several Internet indexes and by many best of the year film lists, both in the USA and in Europe (it would take me half this text to mention them all as well as all the awards). Those familiar with Miyazaki's work will not find awkward that, once again, we are in the presence of a narrative not following the usual steps of introduction, conflict and resolution, nor does it presents us the good and the bad in two well-defined and opposite fields. Except for his first works – Castle of Cagliostro (1979) and Laputa: Castle in the Sky (1986) –, Miyazaki's cinema does not show any concern in defining “the bad” nor in centering the story’s goal in their defeat or removal, choosing instead to develop a complex path their protagonists must follow and overcome so that, somehow, they may find and get to know themselves or succeed in overcoming some difficulties and moving on to another stage in their lives. This is more obvious in Kiki's Delivery Service (1989), but the method is common to most of Miyazaki's work. 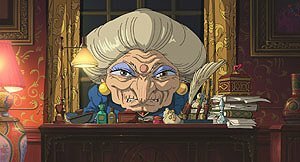 It would be easy to picture that if Spirited Away were produced in the West the witch would be a really bad witch and Chihiro's goal to free her parents and leave the city would require a direct confrontation and the subsequent defeat of the terrible villain. But that is another film altogether. Yubaba does not approve the presence of a human in her bathhouse. On the right: Haku helps Sen. In order to work at Yubaba’s bathhouse, Chihiro is stripeed of her own name, being renamed Sen. It is not a coincidence that the first character in Chihiro's name (千尋) is the same as in Sen (千), although they are pronounced differently. 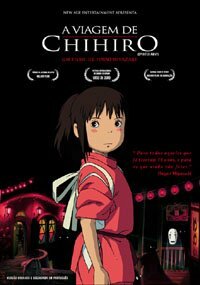 By relinquishing her name Chihiro is loosing an important part of herself without which she will never be able to leave that magical place. Forgetting her original name might prove to be fatal. This is also an essential element to her relationship with Haku (Irino) as the story unfolds. Above: Sen finds a Kaonashi (Faceless God). Miyazaki created a story – “for all of those who are ten years old and for those who already had ten years old” – that might bring a very simple message, as the need to fight and face any obstacles, instead of just being stubborn. Spirited Away turns out a rather complex narrative, involving a multitude of characters and elaborate situations inspired by Japanese myths and traditions – even though most characters designs spur from the author’s imagination –, which will not appear alien even to those who have never seen a film about the supernatural produced in Japan. Visually, the film proves that traditional animation may yet surprise and that simplicity combined with talent is still a major asset. Although the film does not dismiss computer generated images, its usage is much more moderate (more than what might be expected) and appropriate to those moments that might be difficult to animate by hand such as travellings, like the one in which Sen crosses a corridor of flowers, or that in which water pours out of a tank where a “faceless” god (kaonashi) is having a bath. Any resemblance to the usual technical show-off in other animated films is just a coincidence. But the greater impact comes from the characters and the story, rather then the art or the technique used. Sen to Chihiro no Kamikakushi is much more than a good animation film; it is an outstanding work of art and, without any doubt, one of the best films of the year. The first DVD editions came out with a somewhat inappropriate red filter, the result being a colour palette very different from that seen at the movie theatre. Further releases apparently had chroma manipulation, which means no new film transfer was made, they just tried to make the red less noticeable.